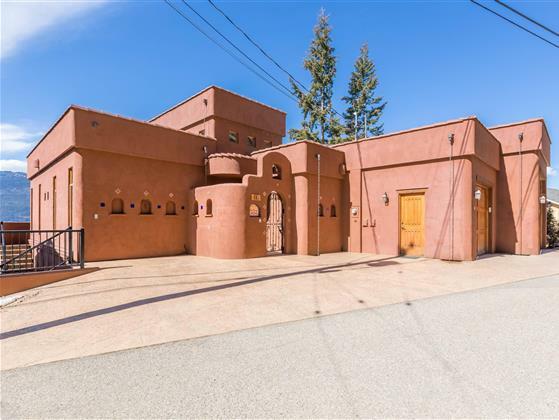 Not your average lakefront estate, this spectacular Santa Fe style property is truly unlike another. Privately set within a desirable gated community, the inspiring custom home boasts panoramic views of Okanagan Lake and a thoughtfully-curated exterior that lends itself seamlessly to waterfront outdoor living. Inside, wide plank hardwood flooring is complemented by timber beams throughout, textured walls, attractive tiling, and wood trims. An open concept layout on the main floor spans from a gourmet kitchen with expansive island, to the dining area with custom bench seating and living room with impressive gas fireplace. From this level, an expansive deck with glass railing and architectural detailing showcases the surrounding mountain and lake views. Elsewhere, the master suite awaits with a private sitting room with wet bar and fireplace, in addition to an ensuite with double sinks and stone shower with skylight. Three additional bedrooms are split between two floors and a bonus theater room awaits for the unlikely poor weather day. Outside, a fabulous covered patio is ideally situated for endless days of outdoor living, complete with a built-in barbecue grill and mini fridge. From this area, a staircase leads down to the lower patio with hot tub, dock, and private beach. With incredible sun exposure and enviable water conditions, this area of the lake is ideal for swimming and boating. Spectacular outdoor living for warm summer days on the lakefront. Ideal area of the lake with great water conditions and sun exposure. Inspiring custom waterfront property in a Santa Fe style. Panoramic views of Okanagan Lake and surrounding mountains. Upper deck with glass railing for unobstructed views. Covered outdoor patio with built-in barbecue and mini fridge. Stairs leading down to lower deck and dock area. Hot tub located on lower deck. Private beach area adjacent to the dock. Outdoor shower adjacent to deck and dock. Large double garage with abundant storage. Open-concept layout with wide-plank hardwood flooring. Timber beams in ceilings and textured walls. Gourmet kitchen with large island, stainless steel appliances, and more. Dining area with built-in seating. Living area with gorgeous gas fireplace. Master suite with private sitting room with fireplace and ensuite bathroom with double sinks and stone shower. Three additional bedrooms on two floors. Bonus theater room on lower level. Located within The Eastside Estates, a desirable gated community. Incredible outdoor living with multiple decks, patio, private dock, and beach. Spectacular water conditions and sun exposure in this area of the lake, ideal for swimming and boating. For a private viewing of this inspired lakefront estate ideal for outdoor living, call the Salt Fowler Team today at 250-549-SALT (7258) and "Just Add Salt"!